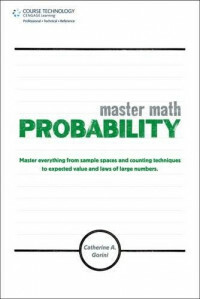 Master Math: Probability is a comprehensive reference guide that explains and clarifies the principles of probability in a simple, easy-to-follow style and format. Beginning with the most basic fundamental topics and progressing through to the more advanced, the book helps clarify probability using step-by-step procedures and solutions, along with examples and applications. A complete table of contents and a comprehensive index enable readers to quickly find specific topics, and the approachable style and format facilitate an understanding of what can be intimidating and tricky skills. Perfect for students studying probability and those who want to brush up on their probability skills.